Check out our Pro Tour Aether Revolt financial preview over here, and join us for round to round coverage in live blog style below all day. Round 4 (1st Round of Standard) started at 9am EST/6am PST, Friday, Feb 3rd, 2017 after three rounds of draft. Here’s how things are playing out. 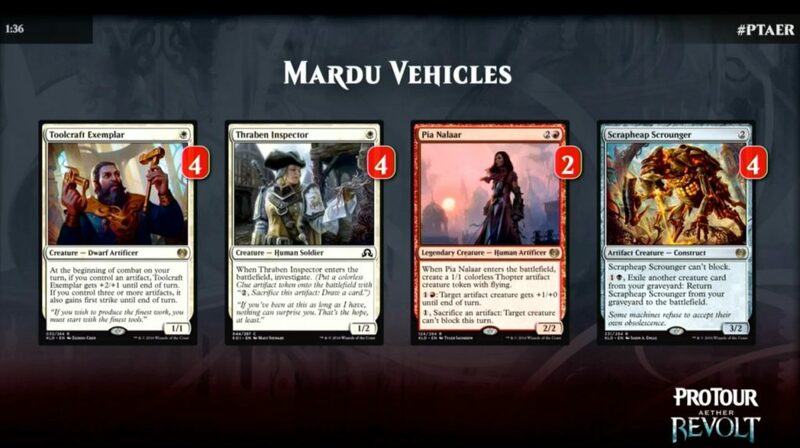 Round 4 starts off with the introduction of a Grixis improvise based deck including Herald of Anguish , which I will cover in more depth once I have full details. It’s worth noting that Inspiring Statuary had spiked to $4 last night on early whispers of a potential breakout deck, but is already falling back on MTGO as any such deck has failed to show up on camera thus far. Here we have two greats of the game, representing major teams in the tournament and both of them on variations of the Copy Cat combo. 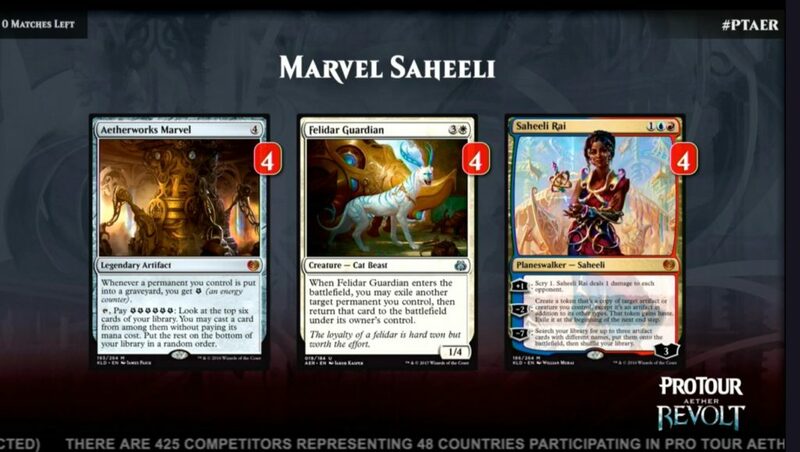 I’m sure WoTC development members are cringing at their desks watching Dagen field Aetherworks Marvel alongside the combo in a hybrid combo brew. 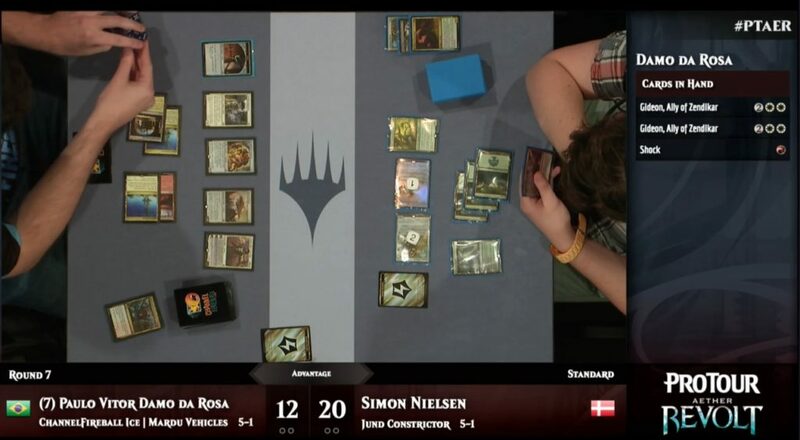 The final game comes down to Sigrist going for the combo, only to have Dagen cast Negate, and allowing Siggy to respond with a Negate of his own to take the match. Paul is 1-0 in Standard so far, but went 0-2-1 in the draft portion. He’s on a controlling variant of Copy Cat that runs some card draw alongside a package of board control and counterspells to address both aggro decks and fellow combo decks. Nothing especially relevant from a financial perspective here, other than the indication that major teams failed to find a new deck that could beat Copy Cat consistently and still address the rest of the field. Both players are at 4-0 coming into this round, having 3-0’d their drafts and won their first round of Standard. 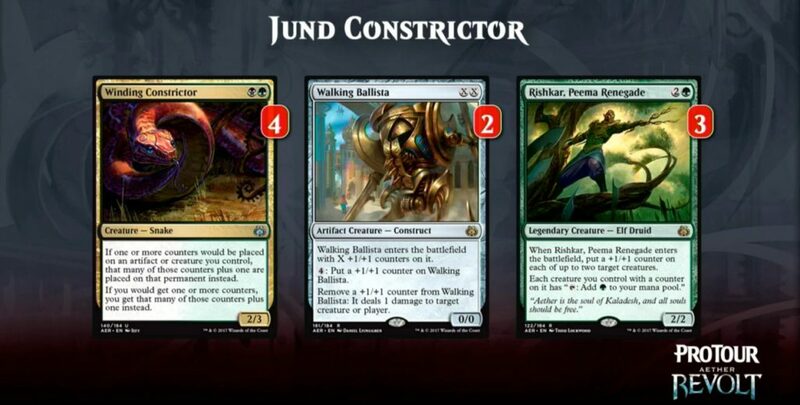 Juza’s deck includes the Greenbelt Rampager to crew Heart of Kiran before returning to hand combo. Pretty slick. Finkel has a Heart of Kiran of his own however, alongside Depala, Scrapheap Scrounger and a heap of good removal. Finkel takes the first game after Juza fails to answer his threats quickly enough. In the 2nd game, Juza manages to field both Voltaic Brawler and Longtusk Cub into a Fatal Push to clear Jon’s Veteran Motorist, and unable to find the necessary lands, Finkel concedes the game and moves to the tie-breaker. In the final game, Juza sideboarded into a more mid-range configuration with Skysovereign, Consul Flagship, and Finkel is caught drawing dead in the mid-game to fall to 4-1, as Juza moves to 5-0. Nielsen outlines that they were focused on early game, so cut two copies of Ballista, which is better late. Nissa, Voice of Zendikar also failed to make the cut and was replaced with Aethersphere Harvester for additional aggro pressure. Longtusk Cub called out as essential when partnered with Constrictor. Catacomb Sifter is there to provide multiple bodies to add counters to as well as minor ramp as necessary. 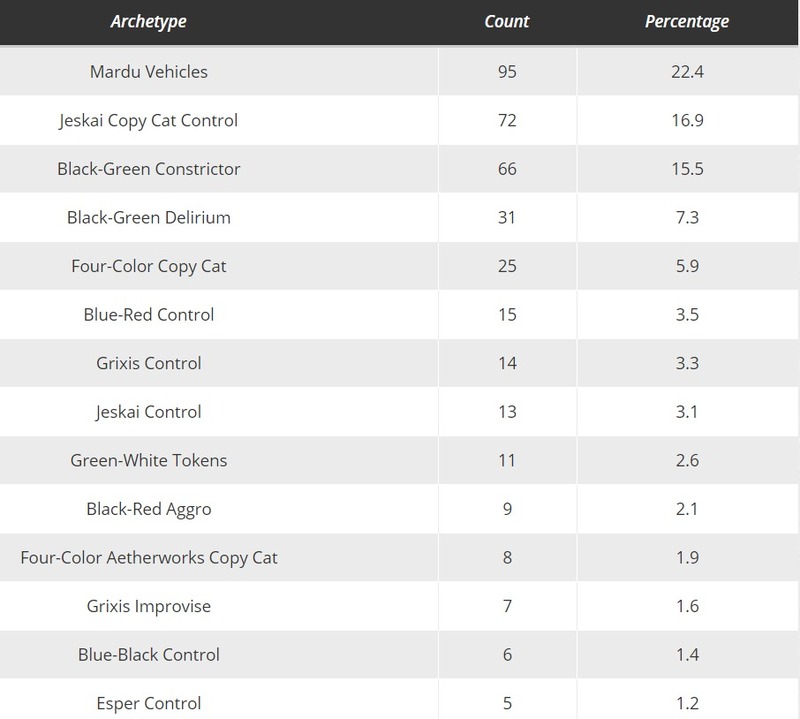 The official tally from WoTC on the Standard Metagame for Day 1 shows a full 22% of the field on Mardu Vehicles trying to apply early pressure on the combo decks while holding answers for both other aggro decks and the Copy Cat combo. The cat decks still managed to hold onto 17% of the field, and BG decks combined for another 23%. A smattering of various control builds make up most of the rest of the field, leaving little room for widespread surprises on the weekend. Note that seven players are on the aforementioned new Herald of Torment Grixis Improvise deck but they are facing a steep road to the Top 8. So far I’m not seeing any cards more important to the format than Torrential Gearhulk and Verdurous Gearhulk, regardless of whether or not the cat combo ends up banned. Both players at 4-1 heading into this round. With a Gideon on board, a key Unlicensed Distintegration allows Hayne to press his advantage in Game 1 and take the lead. In Game 2, stuck on a couple of in play vehicles without crewmates, Hayne is forced to Game 3. IN Game 3, the late game finds Hayne with a mighty board force topped off by Chandra, Torch of Defiance. Hayne takes it in three. On the back table, Kelvin Chew on Mardu Vehicles is battling Ben Rubin on BG Delirium, both at 5-0. Ben wins Game 1, but in Game 2 Kelvin gets Ben down to five life and forces Ben to find a quick succession of answers. 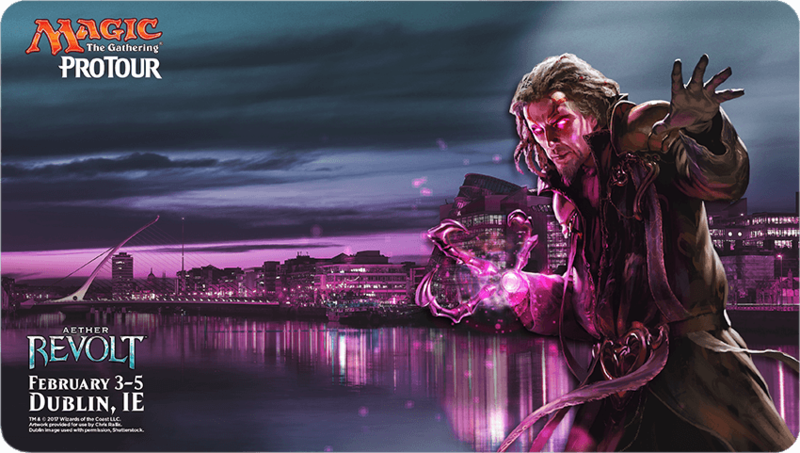 Josh is at the tournament on an Aetherworks Marvel/Saheeli Rai hybrid combo deck that looks to combo people out as quickly as possible and puts Marvel back on the map as a potentially undervalued mythic available for less than $5 and often played as a 4-of. There aren’t a lot of these decks at the tournament, so one of them will need some luck to make it through to the final rounds. Game 1 is a grindy affair that ends up with Paulo staring over at an empty board and a quick concession. In Game 2, Pia Nalaar turning off blocks lets PVD push through the final damage he needs to convert to 6-1. In the meantime, Verdurous Gearhulk, one of my picks on MTGFastFinance this week, is quietly moving towards $20. Could it hit $25 on the strength of the BG and Jund aggro decks this weekend? 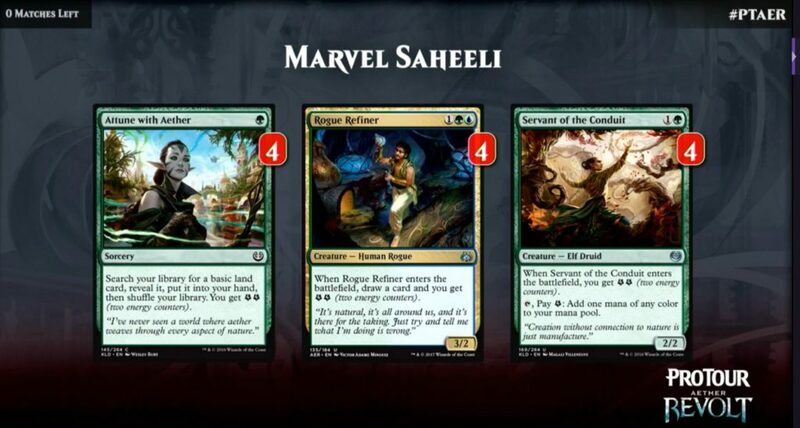 Sam outlines that the Mardu deck puts enough pressure on Saheeli combo decks to keep their Saheeli Rai off the table and has solid game vs. GB decks. 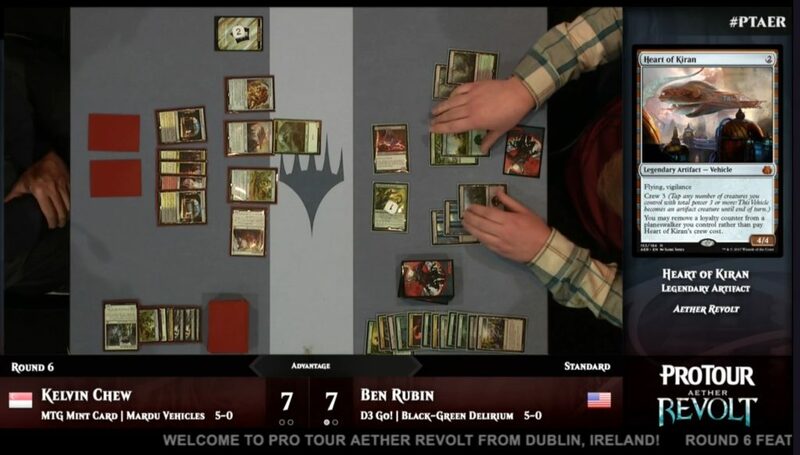 Sam calls out Heart of Kiran as potentially better than Smuggler’s Copter in the deck, and they’re playing it as a 4-of. Along with Torrential Gearhulk and Verdurous Gearhulk, this could be one of the key mythics to see price motion this weekend. Currently available around $14, this could be a card that breaks $25 at some point this year, if not this weekend. There is plenty of inventory in stock however, and we haven’t even hit peak supply for Aether Revolt yet, so buyer beware. Both players are at 7-0 heading into the last round of Day 1. In Game 1, Thien leads off with a double Winding Constrictor draw that threatens to end the game in a hurry with a Rishkar, Peema Renegade in hand. Cesar however has the red direct damage necessary to break up the pressure, and we roll into the mid game with two Scrapheap Scroungers and a Heart of Kiran applying counter pressure as the Central American player switches gears. 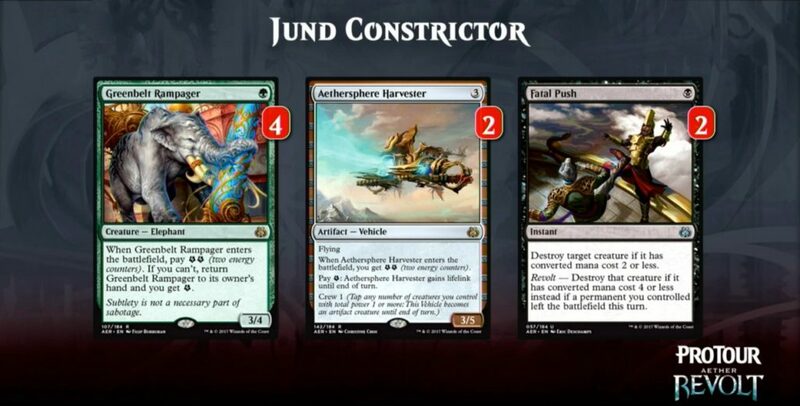 Weldfast Engineer from Segovia puts yet another uncommon card from Aether Revolt on the map, providing combat phase buffs for the RB aggro player turn after turn. Unfortunately, a debatable missed trigger costs Cesar the first game. Yet another deck that is making use of Heart of Kiran in multiples. Card could make a move for $20 if it ends up appearing in multiple Top 8 shells. In Game 2 the players trade off resources, and LSV notes the value of Skysovereign, Consul Flagship coming out of the sideboard for Thien against an aggro deck that has many vulnerable threats. Segovia keeps the pressure up however, and Thien is unable to find a creature to crew his vehicle. Game 2 to Segovia. 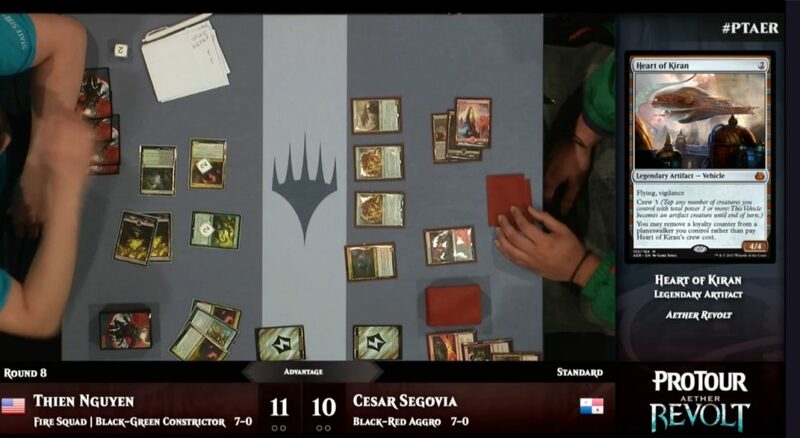 Game 3 turns on Thien getting stuck on three lands and no black mana, and Cesar goes to 8-0 on Day 1 with BR Aggro! In other action a UR Dynavolt Tower control deck in the hands of Toru Inque tries to prevent a loss against BG Delirium by using Torrential Gearhulk to flash back Brutal Expulsion, exiling a Scraphap Scrounger and bouncing a plant token while blocking a Grim Flayer. The game ends up in extra turns, and the aggro player, Jan Ksandr is able to take the match on their final attack phase. 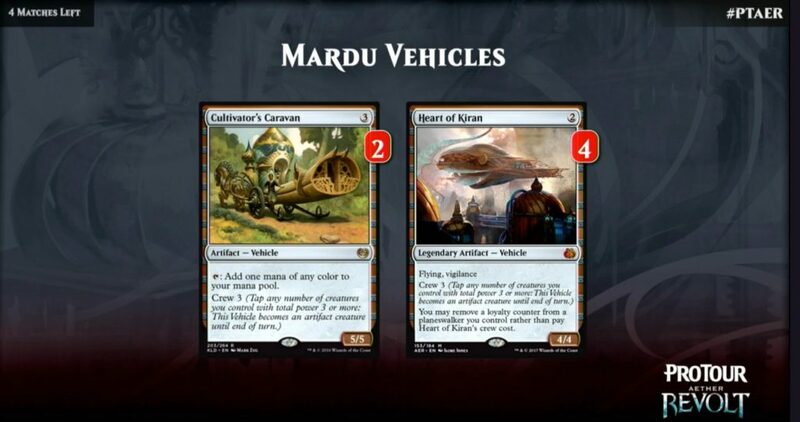 WoTC posted an article highlighting the power of Heart of Kiran on the main site over here. At the news desk Winding Constrictor is dubbed the Card of the Day, potentially setting up the uncommon for modest gains from $1.50 to $2 or $3. Overall, the blue and green gearhulks and Heart of Kiran are the mythics that seem best poised for gains. WoTC also posted a story about the Inspiring Statuary deck that didn’t end up played that might be of interest to folks who spec’d too early on it. Join me bright and early tomorrow for Day 2 coverage of Pro Tour Aether Revolt! Scrapheap scrounger showing up everywhere and you aren’t giving it the nod. I watched all day as tcg started the morning with over 300 sellers/prices and that is down to just over 200 as I write this. Card has doubled in value, and foils haven’t corrected yet. Show some love for this undervalued rare that’s in at least 1/3 of the decks at pt aer. The problem with cards that go from $2 to $4-5 is that unless you can trade out locally it’s tough to clear enough profit after fees, even on a playset, to make it worth your time. You can boost the total gross by going deep but then you might have to rely on buylist pricing as your out, which can be tough. 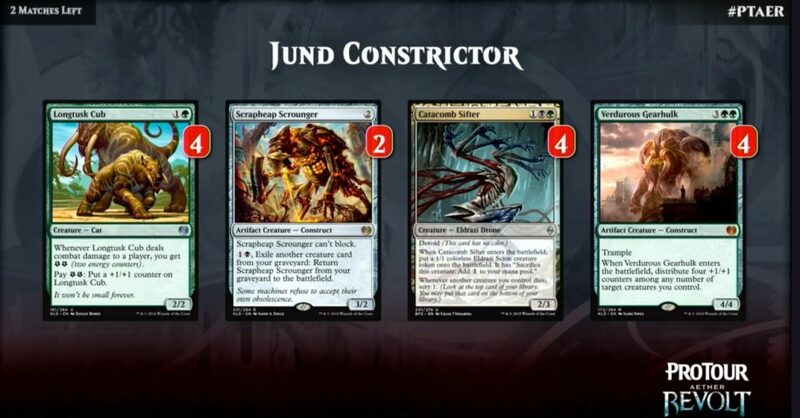 That being said Scrounger is playable in both Modern and Frontier so this pick isn’t crazy. I had feared that Heart of Kiran wouldn’t see life at the ProTour but I’m glad that it has. I love the card alongside any of the 3 mana walkers and am trying to find a way to play it in my Saheeli Jeskai combo deck as just early pressure and an early blocker. Heart plus turn 3 Saheeli is a 4 turn clock (5 damage a turn) if left unopposed. 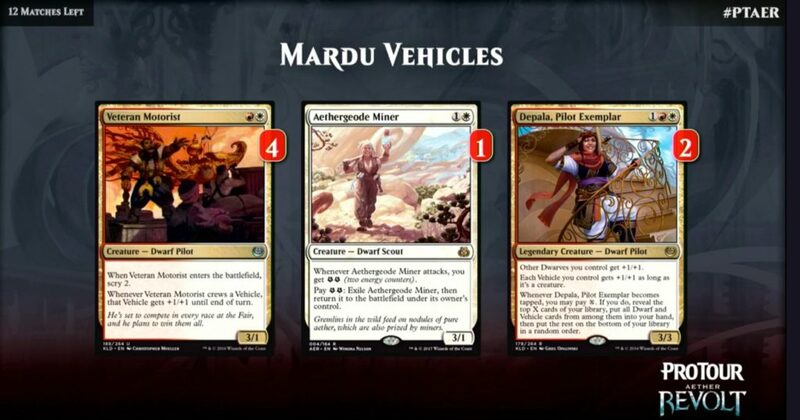 The need to respond by the opponent opens them up to cat combo…but Heart is doing fine as a solid 2 drop vehicle so maybe it doesn’t even need planeswalker loyalty help. One question James, have you seen the templating/printing of the RUSSIAN HEART OF KIRANS?? The name has very unusual printing that I have never seen on any Magic card (but I haven’t seen every card in a foreign language), is there any additional value to the Russian card due to the unusual look/name? Check it out and let me know please. Spencer — Those are Russian quotation marks, used for showing something is a proper noun. No clue how that might be financially relevant. Thank you Ken. I assumed they were, but didn’t understand why they would be there because there’s no quotation marks on the English version.